UPDATE (6/10/2015): The Senate voted in favour of Bill C-51, making it a law. An important decision rests with Canadian Senate. A bill that has garnered over 200,000 signatures in opposing petition could become law if Senators vote to support it. NordVPN breaks down the elements of the proposed ‘anti-terrorism’ law, reviews possible implications. To be fair, NordVPN shall disclose its bias on the topic. NordVPN has long championed internet freedom and we question any laws that limit freedom of expression and can potentially infringe on people’s right to privacy and threaten their online data security. 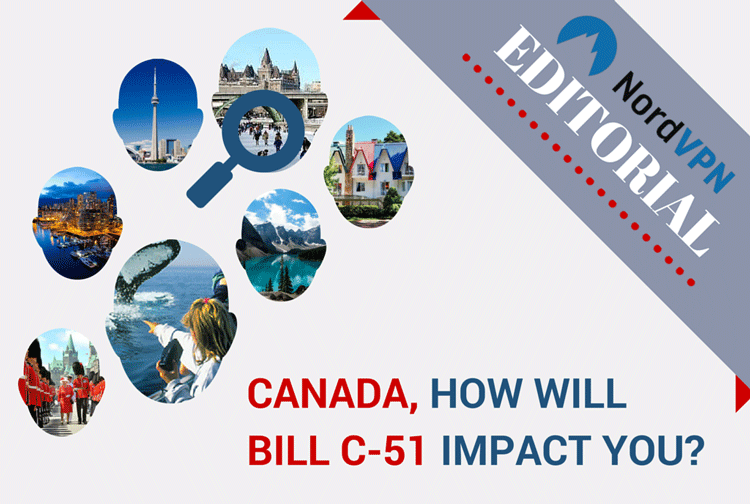 Bill C-51 was proposed in January of 2015, by the ruling majority Conservative party. The bill was proposed in reaction to Charlie Hebdo terrorist Act in France and an incident last fall in the nation’s capital Ottawa, where Canadian soldiers were targeted by terrorist extremists. Prime Minister Stephen Harper, had vowed to protect Canadian interests by strengthening security in the fight against any possible terrorist threats. The bill is meant to expand anti-terror laws that were enacted post 9/11. Anything that is remotely suspicious and might be interpreted as support for terrorism would be investigated. People who would become suspects under such law, could be arrested, prohibited to fly, passports could be revoked, etc. To capture any potential suspects, surveillance powers would be extended and information sharing would become extremely broad. Experts advise, bill’s provisions include sharing information with foreign governments. People could be jailed for making any statements interpreted as supporting/ advocating or promoting terrorism. This includes literature, blog posts, news reports or any other form of expression where a statement could be viewed as promoting terrorism. Special interest groups (environmentalists, first nations rights advocates, pipeline protesters, etc) believed to be ‘high risk groups’, could be infiltrated and placed under surveillance. The bill would grant authorities the power to target activities that could “undermine the security of Canada” as well as activities that are detrimental to Canada’s interests. The bill gives the power “to order the removal of terrorist propaganda” from the internet. The government could ask the “custodian” of “the computer system,” to remove web content deemed inappropriate. Threat to data security Any information stored (and shared) by another party, government or otherwise is at higher risk of being compromised. Your private information will no longer be private when confidential data will be shared between departments for many broad reasons. The bill explicitly permits someone who received information under the bill to use and disclose it “to any person, for any purpose”. Internet Freedom & Anonymity Compromised Removal of internet content is censorship. Bill C-51 would give powers to the judge to order Internet Service Providers to remove the content deemed as ‘terrorist propaganda’. Even if you condemn the issue and comment to denounce the message, just a mention of it, would cause removal and possible scrutiny under the new law. You would be tracked and identified despite the fact that one should be anonymous when using the internet services. Extending and Legalising Surveillance Powers Recent poll shows that Canadians are better aware of surveillance and privacy issues, and they are demanding more government openness and oversight to secretive surveillance practices. They are also concerned about the widespread tracking of Canadian cellphone metadata. In the last two years, we’ve learned the spy agencies of Canada, the U.S., the U.K., Australia and New Zealand (the “Five Eyes”) have been engaged in worldwide collection of metadata and email traffic. Bill C-51 would use the same tracking and surveillance apparatus thus justifying the existence of such programs. Sell Fulfilling Prophecy The mass targeting of particular group might force a feeling of segregation and alienation, which often leads to resentment and in-turn creating actual security threats the law is trying to fight. As far as security is concerned, Canadians could be more attentive to recent USA Department of Justice revelation, that the FBI’s expanded spying powers have not helped crack a single terrorism-related case. Freedom of Expression Curtailed: The surveillance could discourage journalists from pursuing sensitive, important stories because of the fear that they might be misinterpreted or their sources compromised. Same goes for bloggers or anyone using social media as form of expression. Protesters could end up in Jail Activities that are interpreted to “undermine the security of Canada” , broadly stated detrimental to Canada’s interests like critical infrastructure or the economic stability of Canada, are offences under Bill C-51. This means, specific interest groups that lack the proper permits to strike or protest (i.e. environmentalists, pipeline protesters, aboriginal land claims groups, etc. ), might be subject to targeting and will be easier to jail. Travel Restrictions – People could be added to no-fly list if they are somehow identified under the bill. Increased Targeting during Searches Canadian Customs right to search will be extended and cease anything considered ‘terrorist propaganda’. In order to fast track inspections, targeting and profiling might be applied. This would cause racial and ethnic tensions to escalate. Cost- The costs of increased data retention and surveillance programs is will not come cheap. One should ask, who will pay for it and what programs could use the money instead. Marty Phillip Kamden, NordVPN, notes that Canadian interest in privacy concerns is on the steep rise strongly correlated to Bill C-51 discussion timeline. Also, the search for the best VPN service in Canada has peaked in January when Bill C-51 was proposed and has being growing ever since. Traffic from Canada researching NordVPN services increased by 38%. The Organization for Security and Co-operation in Europe published a legal analysis warning that Bill C-51 violates several international standards and treaties, including the Universal Declaration of Human Rights. David Christopher of OpenMedia asserts, argues the implementation of Bill C-51 could case the degradation of freedom of expression. Senate vote is expected Tuesday, June 8th, 2015 (Delayed from Friday June 5th, 2015.